Episode 7: "No Need for an Arch Rival" Episode 7: "No Need for an Arch Rival"
In all the galaxy, there is one name that is feared by all criminals who hear it and are familiar with her: Nagi. If you are a criminal, and you have the misfortune to cross her path, there is a good chance you will end up caught... or dead. With her cabbit friend Ken-Ohki, Nagi travels the galaxy searching for criminals with hefty bounties on their heads. After all, that is how she lives. But of all the criminals that Nagi has hunted, one has eluded her: Ryoko. Because of this, Nagi is obsessed with this space pirate's capture, and she will not allow any other bounty hunter to get her. To do so would be a fatal mistake. When Nagi had learned that Ryoko was hiding on the planet Earth, she traveled there to capture her. Mistaking Tenchi Masaki as her fiance, she kidnaps him to draw Ryoko out. 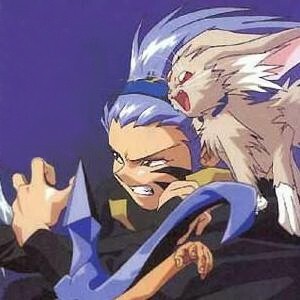 But because Ken-Ohki had fallen in love with Ryoko's cabbit, Ryo-Ohki, a space battle was not possible. So with the arrangement of Washu, a western-style setting was constructed on Mars, with proper life-support. Nagi arrived, trailing a coffin for Ryoko, which also held the still-alive Tenchi. 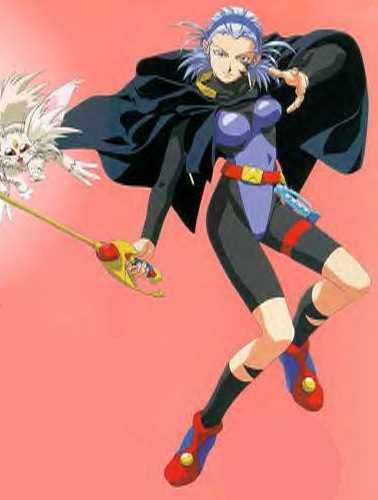 Ryoko and Nagi battled, but the bounty hunter gained the upper hand and was about to kill Ryoko when she was distracted by Ayeka rescuing Tenchi. This allowed Ryoko to subdue Nagi, but was prevented from slaying her by Ryo-Ohki. So their first battle ended in a stalemate. The second time the paths of Nagi and the Masaki clan crossed was when Ayeka and the rest of the clan was being pursued by the Galaxy Police and the Jurai military for allegedly planning a coup against the new emperor, who was claiming to be Yosho. The group had set up a bar at a casino planet and was selling drinks at very high prices. Nagi wandered into the bar, but did not recognized them. The drink that was made for her was very good, but Nagi got angry when she got the bill and stormed out. Later, when the Masaki clan had to make a hasty getaway, Nagi caught up with them, but was blocked by Galaxy Police vessels pursuing the Masaki's and lost them. The third time, the Masaki's were working at a resort planet, where they were preparing to enter Jurai's territory so that they could clear themselves of the treason charges. The group had operated a beachside shaved ice kiosk but was not getting any customers (mostly because Ryoko had shaved all the ice and hogged all the fruit syrup.) Nagi had wandered to the kiosk, hoping to get a beer and recognized Ryoko. The two were about to battle, but Ryoko postponed it because she, Ayeka, Mihoshi, and Kiyone were to compete in the planet's bathing suit competition. Hoping to spite Ryoko, Nagi entered the competition herself... and won. But before Nagi could claim the prize money, Ryoko had stolen it, and the Masaki clan made yet another getaway. The last time came at the old Jurai vacation palace. By then, Ayeka had been captured by the emperor, who turned out to be Yosho's brother, Kagato. Also, both Yosho and Ryoko were seriously injured by Kagato, and the whole clan was about to be captured by a fleet of Jurai's navy when Nagi had rescued them. Although Ryoko was in no condition to fight Nagi, the bounty hunter refused to take her in, preferring to face Ryoko at her best. They were about to leave when Ken-Ohki persuaded Nagi to help them. The bounty hunter, with Ken-Ohki, acted as a decoy for the Jurai fleet by impersonating Ryo-Ohki, while the real Ryo-Ohki, with Tenchi, the knights Azaka and Kamidake, and a gravely injured Ryoko blasted their way through to Jurai to rescue Ayeka. After that was accomplished, Nagi turned around and blasted the fleet pursuing her into debris and fled into space. After that, Nagi, still unaware that Ryoko had returned to Earth, continued to search for Ryoko, hoping to find her... or at least her corpse.